A perfect home for your active lifestyle! Deerfield Commons is located in the lush, green valley of Shippensburg, Pennsylvania. This brand new community was created with thoughful land use and green initiatives for beautiful rental homes that offer convenience, affordability, comfort and upscale amenities. You will love our elevator buildings, cookout and picnic areas, play ground, high speed Internet, nine-foot ceilings, neutral decor, floor plans perfect for entertaining, ample storage, furniture and houseware rental program – all with 24-hour access to on-site repair service. Call 717.530.5111 or email us today for more information about living in a Deerfield Commons rental home. 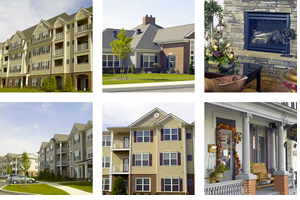 Come home to Deerfield Commons where we have made it simple for you to feel at right at home. You will love the choice of spacious floor plans, fully-equipped kitchens, central air, well-planned outdoor spaces and quality window coverings. Our designers have embraced “green” building initiatives while adding the special touches that you want in your maintenance-free apartment.